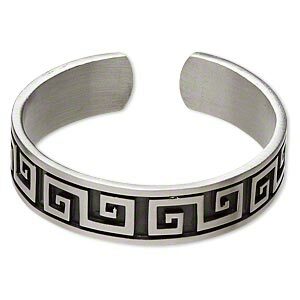 Bracelet, cuff, oxidized pewter (tin-based alloy), 14mm wide with Greek key design, 60mm inside diameter. Sold individually. Item Number: H20-9318JW Have a question about this item? Pewter (tin-based alloy) in modern and tribal style. Cuff bracelets fit most wrist sizes. 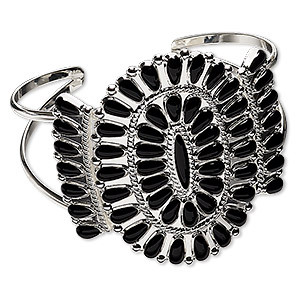 Bracelet, cuff, enamel and silver-plated brass, black, up to 49mm wide Navajo-style cluster design, adjustable. Sold individually. 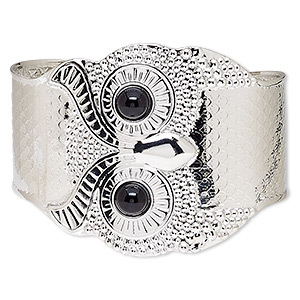 Bracelet, cuff, acrylic and imitation rhodium-plated steel, black, 52mm wide with owl design, adjustable. Sold individually. 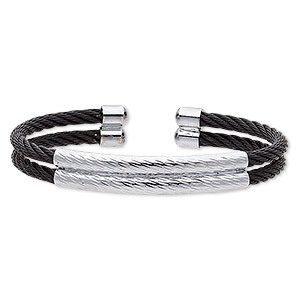 Bracelet, cuff, black- and silver-plated stainless steel, 10mm wide 2-row cable band, adjustable from 7-8 inches. Sold individually. 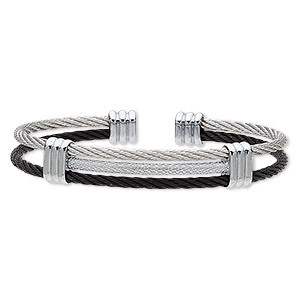 Bracelet, cuff, black- and silver-plated stainless steel, 12mm wide 3-row cable band, adjustable from 7-1/2 to 8 inches. Sold individually. 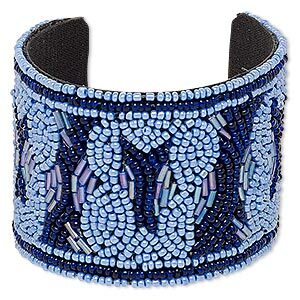 Bracelet, cuff, cotton / glass / steel, black / dark blue / light blue AB, 53mm wide with mosaic design, adjustable from 6-1/2 to 7 inches. Sold individually. 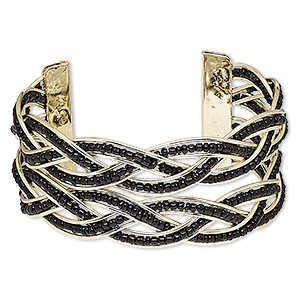 Bracelet, cuff, glass and gold-finished steel, black, 35mm wide with braided design, adjustable from 6-1/2 to 7-1/2. Sold individually. 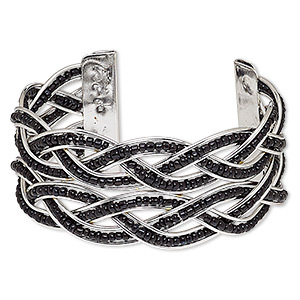 Bracelet, cuff, glass and silver-plated steel, black, 35mm wide with braided design, adjustable from 6-7 inches. Sold individually. 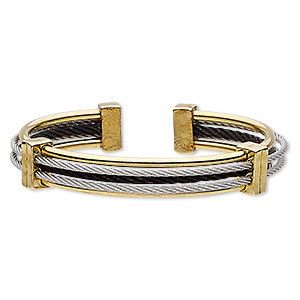 Bracelet, cuff, gold-finished / silver- / black-plated stainless steel, 12mm wide cable, adjustable from 7 to 7-1/2 inches. Sold individually. 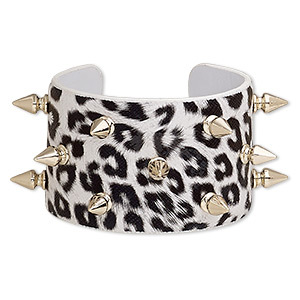 Bracelet, cuff, polyester / acrylic / silver-finished brass, black and white, 42mm wide with spikes and leopard print design, adjustable from 7-8 inches. Sold individually. 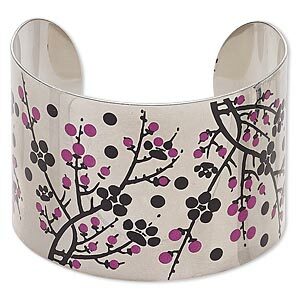 Bracelet, cuff, imitation rhodium-finished carbon steel, black and pink, 46mm wide with cherry blossom design, adjustable from 7-8 inches. Sold individually.